If you are considering owning an Irish Wolfhound, or even a pair, you must familiarize yourself with the Irish Wolfhound temperament. Irish Wolfhounds are the “giants” of the dog world. The breed standard demands a minimum of 32 inches for the male and 30 inches for the female. 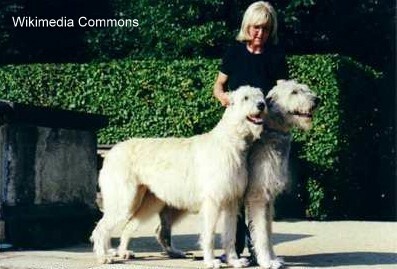 Many Irish Wolfhounds are closer to three feet at the withers (top shoulders). If they get up on their hind feet (which they shouldn't, mind you), they tower to a height of seven feet. In terms of weight, expect the scale to stretch north of 120 pounds (fifty five kilos). Despite their fearsome size, most owners, if asked, are likely to describe the Irish Wolfhound temperament as sweet-tempered. Less biased observers would characterize Irish Wolfhounds as intelligent, patient, and friendly to humans. On the flip side, they are often called lazy, clumsy, stubborn and aggressive with other animals. Irish Wolfhounds have been bred to work with humans … and to kill wolves. Perhaps that is what tends to make them quite friendly toward most humans. Consequently, they usually do not shine in the role of a watchdog, although their very size will certainly be a deterrent to potential thieves. On the other hand, they can be aggressive with other animals. Because their immense size can make them difficult — in fact, close to impossible — to manage, and because that size also makes them deadly to other smaller animals, socialization and training need to be a crucial components of your pet’s early months. The Irish Wolfhound is a sighthound — that is, it needs to stay in visual contact with its prey (as against following a scent). This often meant that it was not in touch with its master when chasing prey. Consequently, it has evolved the ability to take independent action when it moved in for the kill. It is clearly one of the more intelligent breeds. The “intelligence and independent” characteristics further reinforces the need for establishing, early on, the hierarchy under which your pet operates. There should be no confusion in its mind that you are the boss; if there is, the consequences could be disastrous. Surprisingly, your typical Irish Wolfhound’s temperament is quite amenable to doing nothing. Not that she dislikes exercise, but unlike, for example, the Border Collie, it doesn't care if she gets none. Keep in mind, though, that its normal weight is already placing stress on its body — as a result, they are known to be susceptible to cardiac and skeletal ailments — and if you allow your pet to get chubby, be prepared to meet with your veterinarian on a regular basis. Make sure you follow your Irish Wolfhound’s exercise regimen faithfully. This should involve at least sixty minutes of moderate activity daily. 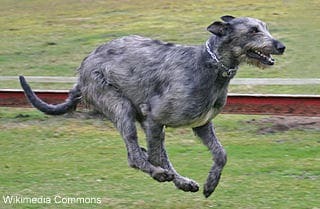 The Irish Wolfhound is rated average in its ability to be trained. As with all dogs, lots of patience and positive reinforcement are the keys. As mentioned earlier, you must focus on obedience; additionally, make sure your Wolfhound behaves impeccably when on the leash. The growing phase of a large dog like your Irish Wolfhound is a crucial phase. Besides the need to focus on socialization and training, your management of her diet is crucial. Large dogs are particularly prone to nasty skeletal problems if their diet is skewed. In the same vein, your puppy’s exercise should be kept moderate at all times, particularly in her first year. She should never be allowed to over exert! Remember that, in general, the larger the dog, the shorter its lifespan. Expect your gentle giant Irish Wolfhound to live to an age of just six to eight years. Don’t consider keeping an Irish Wolfhound as a pet if you live in an apartment or a crowded neighborhood. She needs lots of space — ideally, you should have an estate in the country; at the very least, you will need a large backyard with easy access to dog-walking trails. The characteristics mentioned above relate to the typical Irish Wolfhound. Just like each human has a unique personality, so does your pet. You must remember that her unique Irish Wolfhound temperament will exhibit some departures from that which is typical; it is important that you cater to her specific personality. Next post: How Long Does A Dog Stay In Heat?